Iced tea is one of the many fun things about summer and a great way to survive the heat. There’s nothing like a cold jug of iced tea on a hot afternoon to help you off and be nostalgic about childhoods spent selling iced tea to strangers from your parent’s driveway. You may want to pass on this tradition to your kids or make some iced tea yourself, but you need iced tea maker to get the job done. We did most of the grunge work for you and scoured the market for the very best iced tea makers out there so you have the best options to choose from. Making good iced tea is a lost art; most people just drink the store bought iced tea stuff now. Homemade iced tea is a lot healthier and fun to make and it does not take time at all, the best iced tea makers will produce a glass of the delicious drink in mere minutes. You have to consider how much-iced tea you want to be making. You may be making it for family, for friends during brunches or your kids may want to make some to sell. Whatever the case, you have to buy an iced tea maker with a size that suits your needs. You should also consider space in your kitchen and if you plan to make iced tea just for yourself then you don’t need a big iced tea maker. Iced tea makers are available in different prices, from budget friendly tea makers to high-end tea makers. It’s best to set a budget before you buy an iced tea maker so you don’t end up splurging and buying a budget friendly tea maker does not mean you have to skimp on value and quality. There are several iced tea makers that are reasonably priced and offer good value for money. A lot of iced tea makers have features especially suited to different needs. If you like to drink a lot of tea, there are iced tea makers that come with pitchers so you don’t have to restrict yourself to one glass of tea at a time when you can just make a pitcher-full. There are also iced tea makers that you can program or preset to make your tea at a later time or make a stronger brew. 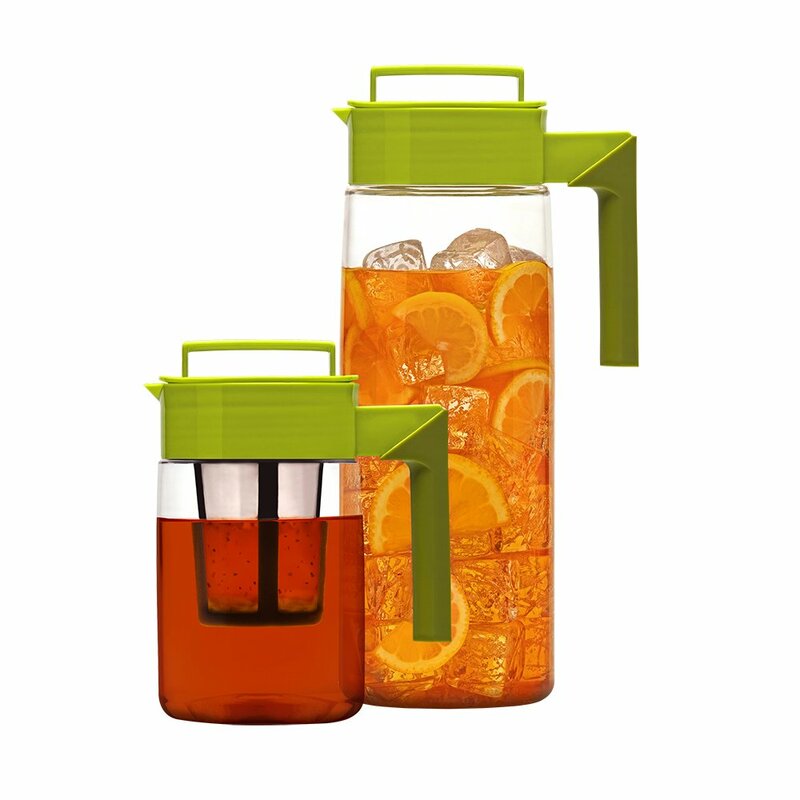 The Takeya Iced tea set is an innovative tea set in the shape of a jug. The tea set has a plain and simple design and will be perfect for you if you don’t drink tea very often and do not have a lot of space in your kitchen. If you worry about safety, the Takeya set has you covered, the set is made from a BPA-free Acraglass material that is lightweight and non-toxic and can be used to boil or freeze beverages. To use the Takeya set, all you need to do is steep your tea leaves then transfer the brew to the ice-filled pitcher, shake your pitcher and your iced tea is ready. If you plan to take your tea with you on a trip, the Takeya set will make an excellent companion. It has a silicon gasket, is airtight and won’t spill or leak. The tea set features a 24-ounce tea maker and a 66-ounce pitcher. It comes with an instruction guide that shows you how to use and clean the tea maker and the set is dishwasher safe. The tea maker comes with a large pitcher that you can store your beverage within the refrigerator. It is made of BPA-free plastic that’s makes the set safe to use. If you are out of gift ideas, the tea maker would make an excellent gift to a loved one. It is a plain and simple tea maker, easy to use and easy to transport. The bottle is very durable and long lasting. Mr. Coffee tea maker has a lot of interesting and useful features that make it one of the best coffee makers available on the market. This tea maker is a great option if you want a tea maker that can produce a lot of iced tea in a short time. The tea maker has a fast brewing cycle that can make up to 2.5 quarts of tea at a time and a 2-in-1 brewing for freshly brewed iced tea. You can select the strength of your brew with the brew strength selector feature on the tea maker and it includes a brew basket permanent filter so you can brew just about anything you want. The tea maker also automatically shuts off after the tea is done brewing, an energy-efficient feature that also saves you part of the cost of electricity bills. The tea maker is dishwasher safe and easy to use. The brew strength feature is incredible, especially if you like your tea strong. With the Hamilton coffee maker, you can brew your coffee right into your glass, fast and efficient if you are rushing out to work and need a quick glass of iced tea or coffee. The tea and coffee maker has a lovely design that will fit perfectly into any modern, stylish kitchen. It does not require a filter and it brews your tea or coffee in a very short time. If you don’t need more than a glass at a time, if you live alone or in a small apartment then this iced tea maker is perfect for you. To make iced tea or coffee, put some ice in a glass and place it under the spout, add your coffee or tea bag to the filter basket. Put some water in the water reservoir, press on and the coffee maker brews into your glass. It comes with an instruction guide that makes the machine very easy to use and it also includes some recipes. For tea and coffee lovers, this machine is an excellent option. The Breville is a nice looking glass coffee maker with a superb design that will fit perfectly with any kitchen decor. It features an automated basket that helps you get a lot of flavor from your tea or coffee, it moves up and down squeezes the flavor and aroma from each tea leaf whether loose or bagged. The machine is very high quality, it performs incredibly well and has some impressive features like the temperature control setting that makes it easy to get the perfect brew whenever you like. The machine also has an auto-start feature so you can set it in the evening before bed and wake up to a fresh brew. The keep warm feature will keep your tea warm for about an hour and the LCD display will show you how long the tea has been brewing. You can’t make just one cup of tea with this machine; the minimum you will get from it is two cups. Another Mr. Coffee Tea Maker with a neat and functional design, this machine features a brew strength bar so you can adjust the strength of tea. A feature that tea lovers will undoubtedly appreciate. It takes about ten minutes to get your freshly brewed coffee from the TM70 and the machine can brew up to three quarts of iced tea. If you are out of ideas on what type of tea and coffee to make, you can always use one of the four recipes included in the Mr. Coffee package. When you’re brewing cycle is complete, your tea maker shuts off automatically, saving energy and costs on electricity. The brew basket is removable and you can brew loose tea without it slipping into your brew. The TM70 turns off automatically which means you don’t have to sit and supervise the machine while it does its thing. You can use tea bags and freshly ground tea leaves or coffee with the machine, it won’t end up in your brew. It comes at a reasonable and affordable price and it’s good value for money. It is easy to make iced tea with the machine and it comes with a clear instruction guide that also includes recipes you can follow. You can put the pitcher in the refrigerator if you want to keep your tea cool. It’s not a portable machine and will take up some space on your counter top. It can be quite hard to add sugar to your tea while brewing it. This machine is another tea maker with an attractive design. The 40912R is also very affordable and budget-friendly so if you are not looking to splurge but want a great machine, this is ideal for you. If you have to rush to work early in the morning, just set your machine while you dress up and it will be ready with your fresh brew under ten minutes. The pitcher can produce up to two quarts of coffee and tea and it has interchangeable coffee and tea filter baskets. You can brew loose or bagged teas with this tea maker and be sure that even fine loose leaf teas won’t slip into your brew. You can also adjust the strength of your brew with the adjustable strength tea basket. The pitcher is also refrigerator safe and the machine is easy to use. If you are looking for a machine that will brew your iced tea and keep it cool for hours, the Keurig is ideal for you. This tea maker comes with an insulated, double-walled pitcher that makes it possible for you to keep your drink cool for some time. It brews two servings of your iced coffee into the pitcher straight from the Keurig machine and it has two spout settings. One with a strainer that allows you to pour your tea without ice and a setting that allows you to store your pitcher easily in the fridge. You may not see the need for an iced tea maker, especially if you are used to the traditional method of steeping your tea before chilling it. But iced tea makers will save you loads of time and still produce a homemade beverage as delicious as any traditionally made or store bought iced tea. Not only is it convenient to have an iced tea maker, with the right one, you get to save time, determine how strong you want your tea, and decide if you want a glass full or a pitcher full of tea. You can even wake up to an already made iced tea. We have made it easier to choose a good ice tea maker by providing the best options available and a buyer’s guide and we will make it even easier by recommending our top pick for best iced tea maker. The Mr. Coffee Tea Cafe Iced Tea Maker cafe comes with a variety of exciting features that we absolutely love. It combines all of our favorite things; fast brewing, ease of use, good capacity, portability and it has a water filtration system. Our review has been thorough and this is, without a doubt, the best we could find and we recommend it.